Older Australians are being urged to take a free online life check which quizzes them on their health, social life and finances in order to assess how prepared they are to live a longer life. The federal government launched its new Life Checks website on Tuesday, inviting those aged 45 and over to answer a series of questions about their health and well-being, financial circumstances, social life and working arrangements, with the aim of helping more Aussies live longer. 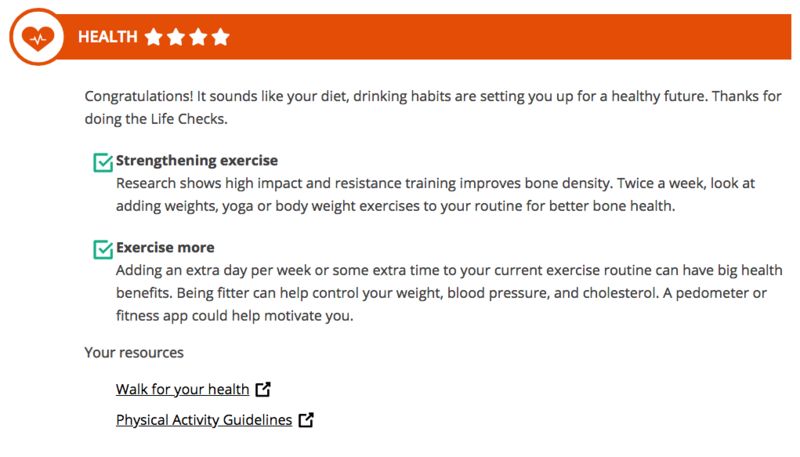 The $6.5 million government site asks questions such as ‘how are you feeling’, ‘what is your approach to the future’ and ‘what are your health priorities’, before delivering a tailored set of results that rank your life out of five stars across all four categories. All results are private and each person receives a score, along with a page of tips and suggestions about changes they can make to “take positive steps towards better health and greater security”. “Life Checks aim to provide Australians with a clear picture of how they are currently tracking and how they can prepare for the next stages in their lives,” Minister for Aged Care Ken Wyatt said. This is an example of the advice provided by the website. Currently the average life expectancy in Australia is 82.5 years, however Wyatt wants more Aussies to reach the 100 mark, predicting a total of more than 40,000 centenarians in the country by 2050. One member of Starts at 60’s editorial team sat down to take the quiz, posing as a woman over-65, to see what advice the government had to offer. Scoring highly in the health category, tips for maintaining that level of good health included exercising more frequently, as well as changing the type of exercise to improve bone density. It was also suggested that they start using fitness apps or a step-counter to track their movement. The website said it seemed like our reporter could benefit from some help with their finances. 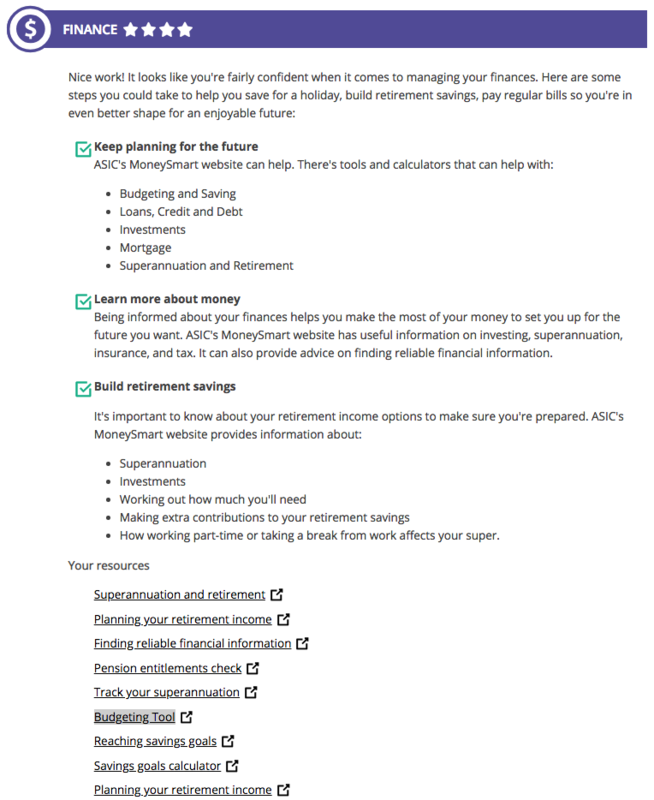 However, our reporter scored far lower when it came to their finances, and the government offered a selection of tips about how to save and build retirement savings by redirecting the user to ASIC’s MoneySmart website. There are two different versions of the quiz, with one aimed at those below retirement age (45-64), while another is tailored to those over the age of 65. “An important aspect of Life checks is assessing people’s financial preparedness for the future,” Wyatt added. “Four in 10 Australians over the age of 55 do not have a financial plan for the next five years, with even fewer people having a plan that extends beyond that. “Options for employment are also included, whether the focus is to keep earning or to stay involved in the community. To find out more or to take the quiz visit www.lifechecks.gov.au. Do you think this is a good initiative? Do you plan on taking the quiz?